The Northwest Passage—the fabled maritime shortcut from the Bering Straight to the eastern Canadian Arctic—is increasingly becoming a real thing as climate change causes an Arctic meltdown. But as these icy waters become more and more navigable, the marine mammals who call them home face new threats. A study published Monday in the Proceedings of the National Academies of Sciences looks at which Arctic marine mammals are most vulnerable to increased ship traffic through the Northwest Passage and the Northern Sea Route, its counterpart that runs from the Bering Straight east along Russia’s remote northern coastline to Scandinavia. Both passageways are seeing an uptick in use as sea ice recedes, yet what future congestion in these waterways will mean for whales, seals, and polar bears is still an open question. To find answers, the researchers examined 80 subpopulations of the seven endemic Arctic marine mammals: beluga whales, narwhals, bowhead whales, ringed seals, bearded seals, walruses, and polar bears. They gave each population a vulnerability score based on both both exposure to shipping routes and sensitivity to things like ship strikes and noise pollution. Narwhals top the list of animals that really aren’t looking forward to their home becoming a commercial highway, both because they’re acoustically sensitive (they use a variety of buzzes, clicks and calls to communicate) and concentrated in areas where ships are likely to show up, especially along the eastern edge of the Northwest Passage near Canada’s Baffin Island. Subpopulations of belugas, bowhead whales, and walruses also scored high in terms of vulnerability, particularly in the Bering and southern Chukchi seas. 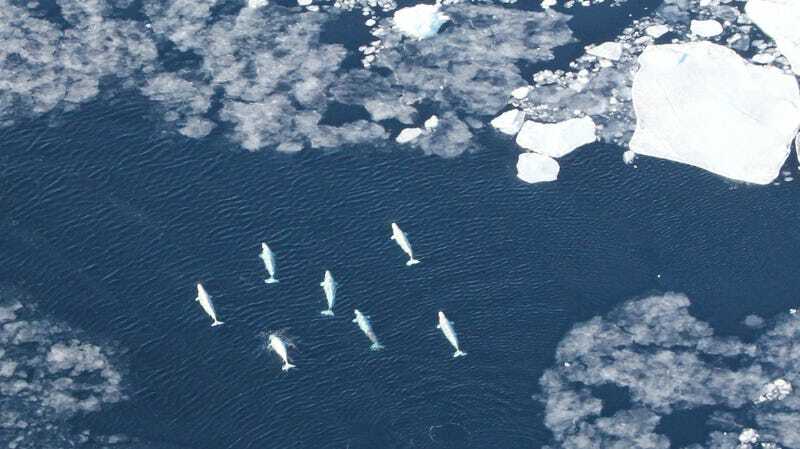 Narwhals in Baffin Bay are among the marine mammals most vulnerable to future shipping traffic. As lead study author Donna Hauser of the International Arctic Research Center at the University of Alaska Fairbanks explained, the Bering Straight is a critical Arctic access point both for ships and animals. “You can think about this as an obligatory pathway vessels are going to use to access the Northwest Passage, but also it’s the only access point for thousands of migratory marine mammals,” Hauser told Earther. Polar bears—often a poster child for the impacts of climate change—actually scored low in terms of their shipping vulnerability. Hauser attributed that in part to the fact that they tend to be on land in September, the time period the study focused on because it’s when Arctic sea ice bottoms out for the year. However, the study also found there’s greater uncertainty in the vulnerability scores for animals safest from ships (polar bears, and bearded and ringed seals), indicating there’s still a lot we don’t know about the range and sensitivity of these elusive Arctic creatures. “There’s a lot of data gaps in general,” Hauser said. There’s also a lot we don’t know about what future shipping traffic in the Arctic will look like, cautioned Olivia Lee, a marine ecologist at the University of Alaska, Fairbanks who wasn’t involved with the study. “It’s not a given that shipping will increase proportionally with the loss of sea ice,” she told Earther. 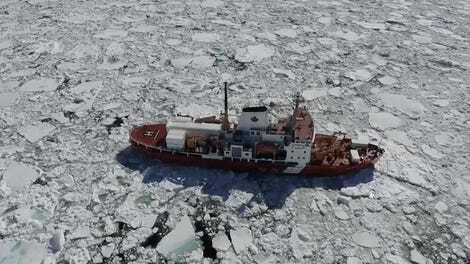 Lee added that while the study looked at fall shipping, the Arctic could also see an uptick in spring shipping activity with icebreakers, which will bring their own slew of ecological consequences. Hopefully, the study will serve as a starting point for wildlife managers to work with the shipping industry to limit its impacts on marine mammals—and the indigenous subsistence communities that rely on them—as the Arctic continues to change. And it’s changing fast, as Lee, who works with communities in the Bering Straight was quick to point out. “We’re seeing spring season becoming ice free so much more quickly than we anticipated,” she said.